Custom Imprinted Oahu Sunglasses - Metallic Red are superb promotional giveaways for school events, kids brands and also various other outdoor events where there are a lot of children participating. 2" x 3/8" imprint area, CPSIA compliant and UV400 protection makes these custom kids sunglasses exceptional. Made of plastic, they are attractive and give excellent protection in the sun. 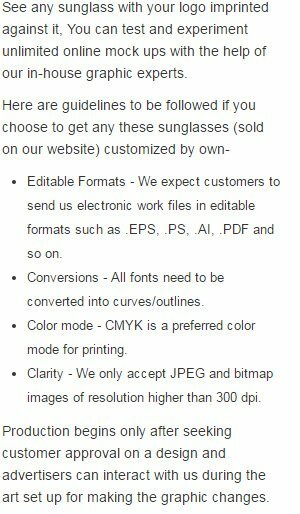 Order these custom new arrival sunglasses today to grab our free online proofs, free design and best price guarantee offers. Request a quote to know the value savings that you can avail on bulk orders of Custom Imprinted Oahu Sunglasses - Metallic Red.